Undefeated WBO Welterweight world champion Jeff Horn scored an impressive eleventh round stoppage of WBO number ten rated contender Gary Corcoran on Wednesday night at the Brisbane Exhibition and Convention Centre in Brisbane, Australia. In what was his first defense of the WBO crown that he won from future Hall of Famer Manny Pacquiao in July of this year, Horn dictated the combat from the outset working from distance and frequently throwing punches in combinations. A highlight of Horn’s offense was his right hand that was frequently the focal point of the numerous combinations he threw. Despite being aggressive throughout the fight, Corcoran’s attempts to apply pressure on the champion were consistently offset by Horn’s lateral movement. Although the fight was competitive throughout, Horn’s crisper offense, ability to consistently get his punches off first, and deflect much of the challenger’s offense was the story of the fight. The bout being lopsided in the champion’s favor however, did not prevent the fight from being entertaining. Horn suffered a cut over the left eye in round six, a cut that was actually originally suffered while he was in training for the bout, but ultimately opened cuts around both of the challenger’s eyes. The second cut, which was opened in round eight over Corcoran’s left eye gradually became worse as the fight progressed. By round eleven with his vision compromised, Corcoran could not see Horn’s punches coming and forced Referee Benjy Esteves to stop the fight. Official time of the stoppage was 1:35 of round eleven. Jeff Horn advances to 18-0-1, with 12 Knockouts. Gary Corcoran falls to 17-2, with 9 Knockouts. In previewing this fight, this observer stated that I felt Horn needed to make a statement in his first title defense following what many felt was a “Controversial“ decision in his victory over Manny Pacquiao. Although Pacquiao’s commitments as a senator in his native Philippines was the obstacle that has for now prevented a rematch between he and Horn from taking place, the new champion was impressive in his first defense of his world championship against a very “Game” opponent in Gary Corcoran. While some might believe that the only way for the “Controversy” that emerged from the decision of the Pacquiao-Horn fight to be put to rest would be for a rematch between the two to occur, all a fighter can do is face the opposition that is put before them and Horn proved in this fight against Gary Corcoran that he is a fighter that can take what some might view as a distraction of potential fights falling through and do what he can do to not only combat the opposition that he did have to contend with in the ring, but by doing so in impressive fashion, was able to maintain his position atop a talent deep Welterweight division as well as open some interesting possibilities for future fights. One such possibility appears to be Horn’s next opponent in the form of undefeated former multi-division world champion Terence Crawford. Crawford, who recently became the Undisputed Jr. Welterweight world champion with a knockout win over Julius Indongo in a unification bout opted to relinquish the championship and set his sights on attempting to win a world championship in a fourth weight class after also holding world championships in the Jr. Lightweight and Lightweight divisions in his career by stepping up into the 147lb. Welterweight division. The World Boxing Organization (WBO) has designated Crawford as its number one Welterweight contender. The question is simply not if Horn defend his crown against Crawford, but when will the fight take place. Two things are clear, Jeff Horn is a star that is continuing to rise that could well be fighting here in the United States when he does face Crawford and when that fight is signed, it will surely be one of the most anticipated fights of 2018. We would like to let our readers know of the upcoming schedule for material, which will close out 2017 here at The Boxing Truth®. On Tuesday, December 12th a preview for the upcoming WBO Welterweight world championship fight between undefeated world champion Jeff Horn and current WBO number ten rated contender Gary Corcoran, which will take place on Wednesday, December 13th in Brisbane, Australia will be released here on the website. On Wednesday, December 13th material recapping Horn-Corcoran will be released. Following the release of post-fight material for Horn-Corcoran, a preview for the upcoming WBO Middleweight world championship fight between champion Billy Joe Saunders and former IBF Middleweight world champion David Lemieux will be released on Saturday, December 16th prior to the fight later that night. Following this, we will be taking a break between rounds for the holidays. Rising Welterweight prospect Khiary Gray rebounded from his recent loss to Jr. Middleweight prospect Greg Vendetti earlier this year by scoring a close eight round majority decision over Philadelphia-based veteran Greg Jackson on Thursday night at the Twin River Event Center in Lincoln, RI. Gray was able to control the tempo of the fight in the early going landing combinations and being able to get on the inside of the taller Jackson’s reach. Jackson however, would gradually work his way into the fight and it evolved into a close contest where Gray’s greater activity appeared to give him the benefit of the doubt giving the Worcester, MA native a hard fought decision victory. Official scores were 76-76, 78-74, 80-72. Khiary Gray advances to 15-3, with 11 Knockouts. Greg Jackson falls to 8-5-1, with 2 Knockouts. The win for Gray, who had previously competed as a 154lb. Jr. Middleweight earned him the Interim New England Welterweight championship in his first fight at the Welterweight limit of 147lbs. Also on this card, in the Women’s Welterweight division prospects Aleksandra Lopes and Natasha Spence fought to an eight round majority draw. This was a fight where neither fighter was really able to stand out clearly from the other as both women had periods of effectiveness in almost every round. Lopes being effective when she was able to use her reach to keep Spence at distance and periodically land counter punches, Spence more effective when she was able to on the inside particularly in the late rounds. At the end of the bout two of three official judges scored the fight four rounds a piece or 76-76 in points, while the third judge scored the fight in favor of Lopes 77-75, resulting in the draw. Unofficially, I had the same score as two of the judges 76-76. The fight was fought at a measured pace and when two fighters are each able to get things done in rounds it can be very challenging to score. This can be more apparent when one factors into the equation that rounds in Women’s Boxing are two minutes in duration and as such fights like this can result in “Swing Rounds” where the winner of the round is determined by moments rather than which fighter was able to control the combat for most, if not all of the duration of a round, which can subsequently cause a difference of opinion as to who got the upper hand. This fight was simply too close to call and this observer can see an argument for either fighter deserving the decision. Aleksandra Lopes advances to 18-4-3, with 1 Knockout. Natasha Spence advances to 8-3-2, with 6 Knockouts. In the Lightweight division Michael Valentin advanced his unbeaten record to 3-0 with a four round unanimous decision over a “Game” Efren Nunes, who was making his pro debut. Valentin controlled the action from the opening bell consistently beating Nunes to the punch and landing combinations. Nunes could not find a way to land consistent offense on Valentin and missed some of his offense by throwing wide looping punches. All three judges scored the fight 40-36 in Valentin’s favor, which was the same score as this observer had unofficially. Also in the Lightweight division undefeated prospect Jamaine Ortiz scored a six round unanimous decision over veteran Derrick Murray. Ortiz used lateral movement and combination punching to dominate the action over the course of the fight. Although he appeared to be tactically out gunned and might have been on the verge of being stopped Murray hung in and made it to the final bell. At the end of the six round bout all three judges scored all six rounds or 60-54 in points for Ortiz. Jamaine Ortiz advances to 7-0, with 4 Knockouts. Derrick Murray falls to 13-4-1, with 5 Knockouts. Fellow unbeaten Lightweight prospect Anthony Marsella scored a first round knockout over Oscar Quezada. Marsella brought the fight to its conclusion in the final seconds of round one with a left hook to the body that sent Quezada down for count. Official time of the stoppage was 3:00 of round one. Anthony Marsella advances to 7-0, with 4 Knockouts. Oscar Quezada falls to 7-5, with 4 Knockouts. In Super-Middleweight action Unbeaten prospect Kendrick Ball advanced his record to 8-0-2, with 5 Knockouts by scoring a stoppage of Alshamar Johnson, who fell to 1-2-1, with 1 Knockout in his career, in the final round of a scheduled six round bout. Ball appeared as though he might have been able to get a stoppage of Johnson in the early going, but Johnson showed his mettle hanging in there and was able to have success in his own right periodically as the bout progressed. Ball however, would bring an end to the fight with a combination of hooks to the body and head of Johnson forcing Referee Joey Lupino to stop the fight. Official time of the stoppage was 1:22 of round six. Bobby Harris advanced his unbeaten record to 2-0 with a four round unanimous decision over Amadeu Cristiano, who was making his pro debut on this card. Official scores were 40-36 (On two scorecards), and 39-37 in Harris’ favor. Jarel Pemberton also advanced his record to 2-0 with a four round unanimous decision over Rene Nazare, who fell to 0-2 in his professional career. Official scores were 40-36, and 39-37 (On two scorecards) in favor of Pemberton. The card also marked the twenty-fifth anniversary of promoter Jimmy Burchfield’s Classic Entertainment and Sports a milestone that was celebrated throughout the evening as CES Boxing celebrated its storied history. Overall this card provided a look at some prospects who are at varying stages of their development in their respective careers and as CES Boxing celebrated twenty-five years of success, the future does look bright for the both Classic Entertainment and Sports as well as the fighters in its stable. Although it remains uncertain as to what the future may hold for fighters like Anthony Marsella, Khiary Gray, Kendrick Ball, and Jamaine Ortiz, just to name a few it will be interesting to see how all of these fighters progress in 2018 as all of them look to make the transition from prospects, to contenders, with the eventual goal of fighting for world championships. The card was streamed live on Facebook by Linacre Media’s FightNight Live and can be viewed on demand on the FightNightLive Facebook page: www.facebook.com/facefightnightlive. For more information about CES Boxing please visit: www.CESBoxing.com. For more information about Linacre Media please visit: www.linacremedia.com. On December 2nd the spotlight of the Boxing world shined on a familiar and historic setting the legendary Madison Square Garden in New York City, NY. A venue rightfully known as “The Mecca Of Boxing “and “The World’s Most Famous Arena.” A venue truly rich in Boxing history and through its several incarnations has been sight to so many memorable battles and historic moments. Through the years many boxers have largely established their base in The Garden. One of those fighters has been future Hall of Famer Miguel Cotto. Cotto, a fighter who has won world championships from the 140lb. Jr. Welterweight to the 160lb. Middleweight divisions has truly had an illustrious career and has been one of the marquee draws of Boxing and of the sport in Madison Square Garden for many years having fought many of his significant battles inside The Garden’s ring. After nearly seventeen years and forty-six professional fights, it was fitting that Cotto’s final battle would come in the venue he had largely established as his home. The thirty-seven year old would defend his World Boxing Organization (WBO) Jr. Middleweight world championship on that December evening. Cotto’s opposition on this night would come in the form of former United States Olympian Sadam Ali. Ali, a native of Brooklyn, NY represented the United States in the 2008 Olympics entered the fight against Cotto with a professional record of 25-1, with 14 Knockouts. Ali’s lone defeat as a pro came in March of last year when he was stopped in nine rounds by Jessie Vargas in a bout for the vacant WBO Welterweight world championship. Since suffering that setback however, Ali had gone unbeaten in three bouts, winning one by knockout, and entered the bout against Cotto rated number nine in the world in the WBO Jr. Middleweight ratings. Despite being eight years the junior of his opponent, his Olympic pedigree, and his momentum coming into the fight there was little disputing the significant experience disadvantage that faced Ali in the form of Cotto, who himself had an Olympic pedigree having represented his native Puerto Rico in the 2000 Olympics and who come into the bout with a professional record of 41-5, with 33 Knockouts. Even though it appeared Cotto had both an experience and power advantage over Ali, this appeared on paper as though it would be a difficult fight stylistically for Cotto. Ali is a slick boxer with good lateral movement and quick hands. If Ali could withstand Cotto’s punching power, it interested this observer to see whether or not the champion Cotto would be able to nullify Ali’s elusiveness and be able to break the challenger’s will as he had been able to do to numerous opponents throughout his career. It is a task however that is often easier said than done even when one is discussing a great fighter as Miguel Cotto is. Ali’s strategy appeared clear from the outset to use his movement to establish himself as an elusive target and in the process offset Cotto’s gradual pressure style. The champion appeared clearly bothered by Ali’s hand speed early on and the challenger was clearly intent on proving that he had come to fight and that this would not be the showcase farewell performance of a future Hall of Famer that some had anticipated. It was the challenger who landed the first significant punch of the fight as he staggered Cotto with a flush right hand to the jaw in the second round. Despite appearing to have clearly hurt the champion, Ali appeared somewhat hesitant to press the issue perhaps out of awareness and respect for Cotto’s punching power. Cotto, as he has shown throughout his career, was able to regroup and appeared to get a slight advantage in the third round. As the fight progressed and evolved into a tactical battle, it became apparent as is sometimes the case in strategic Boxing matches that rounds in this fight would be determined more so by moments that can sway opinion as to who got the upper hand in rounds rather than one fighter being able to stand out clearly from the other for the entire duration of a round. This was primarily due to both fighters having periods of effectiveness throughout. A challenge that can be present when it comes to tactical fights that often end up being close for both official judges as well as observers watching a fight is to look for small, but distinguishable differences between the two fighters and what they are able to accomplish during periods when they are effective. In this fight Miguel Cotto appeared in my eyes to have trouble cutting the ring off from Ali and also had trouble landing solid punches on the challenger consistently. Although Cotto did get the benefit of the doubt in some rounds on my scorecard based on effective aggression in being able to keep Ali on the defensive for periods of time, Cotto was not able to land consistently and was even made to miss punches he threw during periods where he was able to get Ali on the ropes where it was theoretically to his advantage. This was due to Ali’s lateral movement and ability to avoid being a stationary target for lengthy periods of time. It was also noticeable that Cotto was unable to establish a constant attack to the challenger’s body, which could have had an impact on Ali’s ability to use his movement to evade Cotto’s pressure and deflect the champion’s attacks in the middle and late rounds. At the end of the twelve round world championship bout I arrived with a scorecard of eight rounds to four or 116-112 in points in favor of Ali. Although Cotto was able to be effective throughout, I felt the overall difference was Ali’s ring generalship in being able to dictate how the fight was fought as well as his hand speed. Given that this was announced as Cotto’s final fight it would be understandable how some might have felt that Cotto may have and perhaps should have been given the benefit of the doubt given how competitive and close the fight was. It is important to remember that contrary to the beliefs of some, Boxing is supposed to be scored and officiated objectively though there have been several instances throughout Boxing history where a champion/marquee attraction has been given the nod in close fights that could have gone the other way. In this instance however, it would be Ali who was declared the winner by twelve round unanimous decision via scores of 116-112, the same score as this observer, and 115-113 on two official scorecards or seven rounds to five making Sadam Ali the new WBO Jr. Middleweight world champion. As is often the case when it comes to close fights, there could be some rounds in this fight that could be open to interpretation. Rounds that I have often referred to over the years as “Swing Rounds” where there can be a healthy difference of opinion as to which fighter got the upper hand. Even though I feel Ali got the upper hand in this fight, Miguel Cotto was consistently aggressive throughout the fight, but was unable to be consistently effective in that aggression and this along with Ali’s speed and ability to periodically hurt Cotto throughout is what I based my score on. If there is one thing that may have made the fight appear more definitive in Ali’s favor that one could point to and say he did not do consistently was when he was able to periodically stagger Cotto with right hands, hooks, and uppercuts, he did not always press forward and despite being respectful of Cotto’s punching power and ability to counter punch, some could say Ali did not make the most of those opportunities when Cotto appeared to be in trouble. Ali’s tactics were however, enough to score points particularly down the stretch in the late rounds when the fight was on the table. Although as I have also said over the years a scorecard of eight rounds to four may give the impression and appearance of a lopsided fight, in reality it often is an illustration of a close bout where one fighter was able to do a little more than his opponent. Speaking for myself, I felt Ali did enough to win two out of the last three rounds of the fight. If Miguel Cotto had won rounds ten and twelve on my scorecard, I would have ended up with a draw at the end of the fight. For those who scored the fight seven rounds to five in favor of Ali, the margin would be one round that would be the difference between a fight where a winner is declared and one that ends in a draw. Unlike some bouts in the recent history of the sport, there was not an element of controversy, but rather this fight was one where one fighter simply bested the other in a close and competitive fight where both former champion and challenger turned new champion showed the class and sportsmanship that truly makes all of sports great when it is on display. Absent from the aftermath of this fight were accusations of a bad decision and/or questions regarding the scoring of the fight. After what he insists was the last time he would step into the ring as a fighter, Miguel Cotto in his final act showed why he was a great fighter, world champion, and future Hall of Famer by first congratulating his opponent Sadam Ali on his victory and then expressing his appreciation for the support Boxing fans have given him his entire career. Whether or not the end of Miguel Cotto’s era as a superstar of the sport of Boxing will now signal the beginning of the era of the rising star of Sadam Ali remains to be seen. It is my hope however, that the “Class” these two world champions displayed before, during, and after their fight will be something that others in the sport and the fans who support it worldwide will follow as it was one of the highlights of a great fight on yet another historic night of Boxing at it’s “Mecca” Madison Square Garden. Former unified Light-Heavyweight world champion Sergey Kovalev has earned a reputation as one of the sport of Boxing’s feared “Knockout Artists.” After a rise that saw him win and partially unify the World Light-Heavyweight championship successfully defending his crown eight times between 2013-2016, Kovalev was defeated in November 2016 by Andre Ward in what some feel was a controversial twelve round unanimous decision. The bout, which was highly competitive as well as the subject of the decision fueled demand for a rematch between Ward and Kovalev. The second encounter between the two that took place in June of this year would also have an element of controversy as Ward would be declared the winner via stoppage in the eighth round after a series of body punches caused Kovalev to take a seated position on the middle rope as Referee Tony Weeks stopped the bout. Although the second encounter between the two appeared to be more conclusive in Ward’s favor, video replays indicated that some of the punches, which led to stoppage were in fact low blows as Weeks acknowledged shortly after the fight that he had stopped the bout because Kovalev was not protecting himself, but did not see the low blows and that if he had seen those punches hitting the former world champion below the belt, he would not have stopped the fight. In an era where there is much criticism of how the sport of Boxing is officiated both in terms of the refereeing of bouts as well as how fights are scored, Weeks’ acknowledgment of a mistake on his part as one of the best referees in the entire sport is something that should have been applauded by Boxing fans and experts alike. Despite the acknowledgment of a human error by Weeks, the technical knockout in favor of Ward did stand. Now coming off two consecutive losses including the controversial knockout loss, Kovalev will return to the ring on Saturday night to take on top Light-Heavyweight contender Vyacheslav Shabranskyy at The Theater at Madison Square Garden in New York City, NY in the main event of a card televised here in the United States by HBO Sports. The twelve round bout, which was to determine a new mandatory challenger in World Boxing Organization’s (WBO) Light-Heavyweight ratings, was charged recently following the retirement of unified WBO/IBF/WBA world champion Andre Ward. With the International Boxing Federation (IBF) recently crowning a new world champion in the form of the undefeated Artur Betrebiev, the WBO will now crown its next World Light-Heavyweight champion between the former champion Kovalev, currently rated number two in the WBO Light-Heavyweight ratings and the number ten rated contender Shabranskyy. It is understandable how some may choose to criticize the WBO’s decision to designate this bout as being for its Light-Heavyweight world championship based not only on the current ratings of the two fighters, but perhaps more specifically the fact that Kovalev will enter the bout off of two losses with the most recent loss coming via stoppage. Although it is understandable how one might question the WBO’s decision, it is important to remember that prior to his battles with Andre Ward, Sergey Kovalev was a long-reigning world champion and despite the second loss to Ward, the controversial way in which that fight ended could have played a part in the WBO’s decision. It certainly is not the first time that Boxing has seen a bout for a vacated world championship emerge under similar circumstances and it probably will not be the last. The political elements of the sport notwithstanding, the story of this fight in addition to the WBO Light-Heavyweight world championship in this observer’s eyes will be Sergey Kovalev and whether he will be able to reemerge at the top of the Light-Heavyweight division. A fair question to ask of fighters that are known as “Knockout Artists“ once they suffer a loss is what effect will the setback or in Kovalev’s case setbacks have or have had on them. The controversial stoppage in his last fight may cause some to question the validity of that loss, but the fact remains that Sergey Kovalev has lost his last two bouts and that has to have some sort of impact on a fighter, particularly one who was able to dominate their division for as long as Kovalev had before suffering the adversities he has. Will this fight signal the return of the fighter known to his fans as “The Krusher” or will this be a different version of Sergey Kovalev? Kovalev’s opposition on Saturday Vyacheslav Shabranskyy will enter the fight with a solid record of 18-1, with 16 Knockouts having stopped 80% of his opponents inside the scheduled distance of a fight. Shabranskyy has won his last two bouts including winning the World Boxing Council (WBC) affiliated United States Boxing Council (USBC) Light-Heavyweight championship in August of this year with a stoppage of previously unbeaten Todd May. Shabranskyy however, was stopped in his lone career defeat at the hands of top Light-Heavyweight contender Sullivan Barrera in December of last year. Even though momentum appears to be on Shabranskyy’s side as this fight approaches, the edge in terms of experience will be in Kovalev’s favor and it will be interesting to see how Shabranskyy deals with the “Big Fight” atmosphere for the first time. Whether or not the outcome of Kovalev’s last bout will influence Shabranskyy’s strategy in this fight remains to be seen. Despite his recent setbacks however, Sergey Kovalev, who will enter the bout with a record of 30-2-1, with 26 Knockouts, is still a fighter who has the capability of knocking an opponent out with either hand who has also scored knockouts in nearly 80% of his career wins. With Andre Ward now retired one might assume that the biggest fight that could be made in the 175lb. Light-Heavyweight division assuming Sergey Kovalev is successful in this fight against Vyacheslav Shabranskyy and becomes a two-time world champion on Saturday night would be a long-awaited showdown between Kovalev and longtime WBC world champion Adonis Stevenson. Before any talk can resume of that potential clash, Kovalev must show he can bounce back from adversity. In a division that is seeing it’s landscape change, it is a task that could prove to be difficult, but one that if Kovalev is successful and goes on to enjoy a second reign as a world champion, the adversities that have derailed his career in recent times could end up being mere chapters in the story of a great fighter.A new chapter in the career of Sergey Kovalev now begins and we will see what happens next. Kovalev vs. Shabranskyy takes place tomorrow night (Saturday, November 25th) at The Theater at Madison Square Garden in New York City, NY. The fight can be seen in the United States on HBO Sports beginning at 10PM ET/PT. check your cable/satellite provider for time and channel in your area For more information about HBO, HBO Sports, and HBO Boxing please visit: www.hbo.com. In the United Kingdom and Ireland, the fight can be seen on Sky Sports Main Event (Formerly Sky Sports 1) on Sunday, November 26th at 3AM (Local UK Time.) For more information about Sky Sports please visit: www.skysports.com. Check your listings internationally. We here at The Boxing Truth® would like wish our readers a very safe and Happy Thanksgiving. We would also like to inform readers that new material previewing the upcoming WBO Light-Heavyweight world championship fight between Sergey Kovalev and Vyacheslav Shabranskyy will be released on Friday, November 24th. Material recapping Kovalev-Shabranskyy as well as other Boxing action that has and will be taking place over Thanksgiving week will be included in the upcoming year-end edition of the regular feature Observations On Recent Events In Boxing, which will be released in late December. Stay tuned. "And That's The Boxing Truth." We would like to let our readers know that new material will be released here on the website on Friday, November 17th. Stay tuned. "And That's The Boxing Truth." Press Release: November 14, 2017 By Sanman Promotions – Filipino boxer Harmonito “Hammer” Dela Torre of Sanman Promotions will be facing 2012 London Olympics silver medalist Tugstsogt “King Tug” Nyambayar on November 18th at the Cosmopolitan in Las Vegas, Nevada, USA. The fight is promoted by the Mayweather promotions. It will be the third fight in the US for the unbeaten Dela Torre (19-0, 12 KOs). Dela Torre previously won by a unanimous decision against Mexican Jose Luis Araiza (31-18-2) last November 11, 2016 at the Winna Vegas Casino and Resort. “I have trained for this fight. I am in great shape. 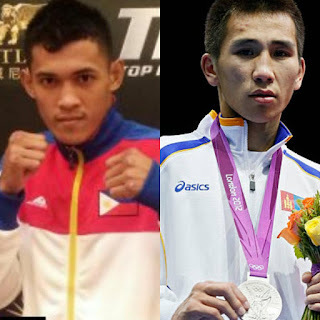 I know he is an Olympic silver medalist and a big puncher but I will come to Las Vegas for a victory,” said the 23-year old Dela Torre. Dela Torre has trained for a couple of months in Miami, Florida under Cuban coach Moro Fernandez. “This will be a great fight. Both undefeated boxers going head to head,” said Dela Torre’s manager Jim Claude “JC” Manangquil, chief executive officer of Sanman Promotions. “We are for a big victory for him (Dela Torre),” said Manangquil. Nyambayar, however, is also undefeated with eight straight wins all by knockouts. As an amateur, he won a silver medal at the 2009 World Amateur Boxing Championships at the age of 17. He went on to win the silver medal at the 2012 London Olympics, losing to Cuban boxer Robeisy Ramirez by a score of 14:17 in the final. Nyambayar, who was born in Mongolia, scored a 10th round TKO win against Jhon Gemino during his last fight held February 25th at the Legacy Arena in Birmingham. In 2015 he signed with manager/adviser Al Haymon and made his professional boxing debut on March 2015. He's trained by Hall of Fame boxing coach Joe Goossen at Ten Goose Boxing Gym in Carson, California. For more information about Sanman Promotions and to watch the Sanman Live Boxing Series please visit: www.facebook.com/Sanmanpromotions. Longtime readers have become accustomed in recent years to me referring to the Heavyweight division as one that was heading toward a period of transition. Some may recall that I first said this while the division was still being ruled by what this observer called “The Two-Headed Heavyweight Championship Monster” known as the Klitschko brothers. As longtime WBC Heavyweight world champion Vitali Klitschko entered retirement in 2013 and Wladimir Klitschko’s long reign as a unified world champion coming to an end a year later with his loss to Tyson Fury, the division began the transition process. Although Fury defeated Wladimir, he would step away from the sport vacating the various world championships that comprised the unified Heavyweight world championship leaving room for several fighters to attempt to emerge as the division’s next central figure. Three world champions have emerged to sit atop the division who all recently defended their respective shares of the World Heavyweight championship. Three fighters all of whom are undefeated and are all looking to be recognized as the number one fighter in the division. Readers may recall this observer’s coverage of current World Boxing Organization (WBO) Heavyweight world champion Joseph Parker’s recent title defense against unbeaten WBO number one contender Hughie Fury in September. A fight where the champion ultimately retained his crown with a twelve round majority decision. Most of the attention of the division however, has centered around unified IBF/WBA/IBO champion Anthony Joshua and WBC world champion Deontay Wilder. Two fighters who are known as “Knockout Artists” and two men who had to deal with similar circumstances in having their opposition for each champion’s respective title defenses changed. Joshua, who had unified his IBF crown with the vacated WBA and IBO world championships with a thrilling stoppage of Wladimir Klitschko in April of this year, was to defend his unified world championship against former world title challenger Kubat Pulev on October 28th in Cardiff, Wales. This title defense however, would be changed when Pulev had to withdraw from the bout due to an injured shoulder he suffered while in training for the fight. Top Heavyweight contender Carlos Takam stepped in to replace Pulev and faced Joshua at the Principality Stadium. Under circumstances where Joshua was expected by some to not face much resistance, Takam put forth a valiant effort in engaging the champion in a grueling battle where he suffered cuts over both eyes and the champion appeared to suffer a broken nose in the second round as a result of an accidental clash of heads. Takam’s “Game” performance was not enough to overcome the champion as Joshua would stop the challenger in the tenth round to successfully defend his championship for the fourth time. Although some may be critical of Joshua’s performance in this fight, it should be noted as I have said over the years that under circumstances where an opponent is changed on short notice that it is difficult for the fighter who had his opposition challenged as much as it is for the fighter steeping in with a limited time to prepare. Joshua, who advanced his record to 20-0, with 20 Knockouts with his victory over Takam did what he had to do and sometimes it’s best to look at a fighter’s performance as one that will likely help him progress going forward. Deontay Wilder meanwhile defended his portion of the World Heavyweight championship on November 4th at the Barclays Center in Brooklyn, NY. Similar to the situation Anthony Joshua faced in his title defense, Wilder saw a change in opposition when his original opponent top undefeated Heavyweight contender Luis Ortiz failed a drug test in September for a banned substance. This opened the door for former WBC Heavyweight world champion and WBC mandatory challenger Bermane Stiverne, who Wilder defeated for the WBC world championship via twelve round unanimous decision in January 2015, to step in and meet the champion in a rematch. The first encounter between the two was one that went the distance where Wilder won the fight and the championship with a convincing decision win. Given how Wilder outboxed Stiverne in that bout, some may have questioned why a rematch would be warranted. Stiverne however, was moved into a mandatory position to challenge Wilder after he saw a fight, which was to determine a mandatory challenger fall through the day before it was to take place when his scheduled opponent longtime Heavyweight contender Alexander Povetkin tested positive for a banned substance before their scheduled bout in December of last year. The Povetkin fight falling through in addition to not wanting to jeopardize his mandatory position resulted in Stiverne being out of competition for almost exactly two years since defeating Derric Rossy in November 2015. Stiverne however, did have the distinction of being the only man to go the distance with Wilder in the champion’s thirty-eight previous fights. Despite this, the rematch would not go beyond the first round as Wilder dropped Stiverne three times forcing a stoppage of the fight in what was Wilder’s sixth title defense and advanced his record to 39-0, with 38 Knockouts. Rather than focusing attention on the commonality of these two fights in terms of the subject of tests for banned substances causing a change of opponent for both world champions as it would be a separate column in of itself as to this ongoing issue throughout all of sports, an interesting question will be what will be in store for Wilder, Joshua, and Joseph Parker in 2018. It should be no secret to longtime readers that I am a big supporter of unifying all world championships across all weight divisions to ultimately determine one “Undisputed world champion” per weight class. Determining an “Undisputed world champion” has proven to be a difficult task for a variety of reasons throughout the sport. In regard to the current landscape of the Heavyweight division some might argue that Joshua’s victory over Wladimir Klitschko earlier this year as well as Klitschko’s subsequent retirement rather than seeking a rematch, was in some ways a passing of the torch. The counter argument to that is there are three undefeated world champions in the division currently and that the torch as Boxing’s number one Heavyweight is still very much up for grabs. There is also the element of contenders who may not currently be in the equation who are always looking to climb the ladder and get an opportunity to face one of the world champions in the division. With the possibility of full unification of the Heavyweight division looming and with several contenders all looking to get an opportunity to fight for a world championship, 2018 looks to be an exciting year for the Heavyweight division. Press Release: November 6, 2017 – By Sanman Promotions GEN. Santos City --- The fighting Mama twins of Sanman Boxing Club remained unbeaten after scoring contrasting wins in the “Brawl at the Mall: Young Gunz” last Sunday night (November 5th at the Robinson’s Mall in General Santos City. Jayson Mama successfully made his debut in the 10 rounder by stopping a more experienced Rodel Tejares via a technical knockout during the rest period of the 6th round in the main event. Mama, a Flyweight started to dominate the fight in Round 2 with his quickness in throwing his left-right combinations to keep Tejares at bay. Mama’s solid punches forced Tejares to quit the fight after five rounds. “It was a great learning experience for him (Jayson). He fought a veteran in his first 10 rounds and performed well,” said Sanman Promotions CEO Jim Claude Manangquil. 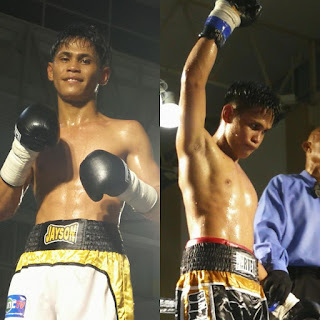 The 20-year old Mama scored his 8th straight win and 4th knockout while 33-year old Tejares, who is a veteran of five championship fights, dropped to 21 wins, 6 KOs, 45 losses and 7 draws. “Jayson is young and his future looks good for him,” Manangquil said. Earlier, Jerven Mama used his combinations and solid punches to score a convincing unanimous decision against Joey Antonio of Empire Gym Davao in a 6-rounder match. “Jerven (3-0, 2KOs) was also impressive tonight,” added Mananquil. Judges Romy Fordaliza and Lito delos Reyes both scored 59-55 while judge Mario de Ramos had it 60-54 all for the Super Flyweight Jerven. Meanwhile, reigning IBF Youth Super Flyweight champion Jade Bornea landed powerful body shots to pummel to submission John Rey Lauza in just 46 seconds of the 2nd round. Bornea, who also has a twin boxer, now has 10 wins with seven knockouts. He just retained his title by 4th round TKO win Samuthra Sitharan last Sept. 9th in Polomolok. “Bornea also showed his world class skills and his future is also bright,” said Manangquil. Journeyman Nicong Calamba of Agusan del Sur scored an upset against early-favorite Jestoni Makiputin via a 6th round knockout. Calamba’s antics destroyed Makiputin’s fighting style. Rimar Metuda also of Sanman stopped Richard Betos by a TKO in the rest period of the 5th round after the later was bombarded with body and head shots in the 4th round. Six other young Sanman fighters also all won convincingly. Jason Francisco TKO’d Michael Borja in 2:27 of the 3rd round. Dave Apolinario TKO’d Rez Padrogane in 2:40 in the 5th round after a grueling match. Mark Antonio TKO’d Romulo Ramayan in 1:31 of the 6th and final round. Ramayan turned his back after absorbing a relentless attack by Antonio. Jerry Francisco won by UD against Elizer Ambon, who was also deducted for clinching. Judy Flores made his successful debut by beating Jeorge Perez via a UD. Jhun Rick Carcedong also won his pro debut via a TKO in 55 seconds of the first round against Rico Nakario of Bukidnon.. The boxing card was promoted by Sanman’s Jim Claude Manangquil and Dexter Tan Also present among the huge crowd were former two-division world champion Gerry Penalosa and current WBC Youth Intercontinental Lightweight champion Romero “Ruthless” Duno. Material and photo courtesy of: Sanman Promotions Used with permission. For more information about Sanman Promotions and to watch the Sanman Live Boxing series please visit Sanman Promotions’ official Facebook page at: www.facebook.com/SanmanPromotions.